Few dog breeds have such a commanding presence as the Rottweiler! They’re big, brown, and bold beauties. They are powerful and strong. You can tell with one glance. Rottweiler puppies just have that unique presence and greatness about them. Are you interested in checking out our Rottweilers? Before you do, keep reading to learn more about this large but lovely breed. Start training your Rottweiler puppy early. You will soon learn that they are relatively easy to train. They can pick up commands with ease. Experienced and new owners can train them with little to no problems. All across the world, Rottweiler puppies are purchased to assist the police and military. Its powerful nose and keen intelligence make it a popular protective breed. We’ve said this once, but we’ll repeat it. Rottweiler dogs are powerful and strong. They are also one of the most loyal dog breeds. They will protect you and your family ’till the end! Intruders beware because if trained properly they will take you down without hesitation! To keep their protective nature in control, socialize your Rottweiler puppy when they’re young. It’s important to expose your Rottweiler to different animals and environments so that they can become accustomed to these things as they get older. Because of their size, the Rottweiler needs to be given high-quality food. They are prone to obesity, so if you have questions about their diet, let us know! The Rottweiler requires regular exercise to keep their muscular bodies in tip-top shape. They should be taken for a run or walk at least an hour a day. We believe that Rottweiler puppies are one of the best family pets out there. Despite their downright intimidating looks, they are very sweet and lovable and will do great with children of all ages. 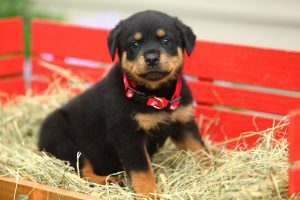 Do you want to check out our adorable Rottweiler puppies for sale? Just click here for our available puppies’ page.